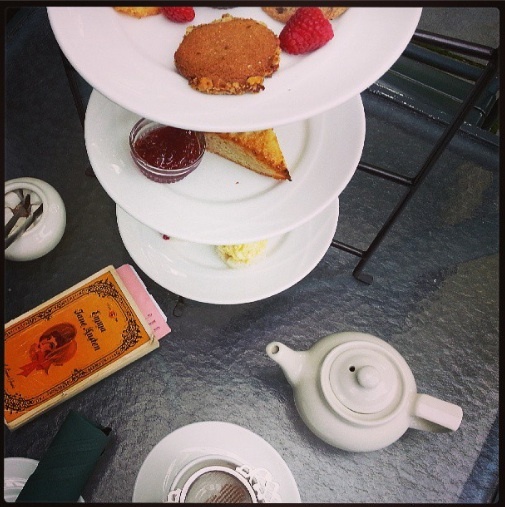 Posted on September 16, 2013 by Sarah S.
When I learned that The Cafe at the Frick, which is situated on the beautiful Frick Park grounds, served proper afternoon tea, I couldn’t wait for a free Sunday afternoon to give it a try. My high expectations were not let down! For $18, I enjoyed four different types of salads (crab, beet, tuna, and egg), two scones (orange and lavender) complete with English sweet cream and strawberry preserves, a variety of four cookies made perfect with chocolate sauce, and of course hot tea (I chose the Frick’s specialty blend). I also enjoyed the perfect autumn weather and a gorgeous view of the gardens surrounding the Clayton mansion. Not to mention, I was reading Jane Austen’s Emma the whole time, which let me tell you, when coupled with tea, is probably the most sublime experience you’ll have in a long time. Reading about Emma discovering her love for Mr. Knightley while eating a lavender scone, is a Jane Austen lovers dream, I would think! To top it off, the service was excellent. Before they closed at 5pm, I even had time to take a look at the art galleries, which hold a great experience of their own. For more information about the cafe, the museum, and the park, be sure to visit the Frick website. This entry was posted in Travel and tagged adventure, afternoon tea, frick cafe, frick park, jane austen, pittsburgh, tea. Bookmark the permalink.